This article was previously published in the World Economic Forum Blog, on January 24, 2019, and is part of the World Economic Forum Annual Meeting. 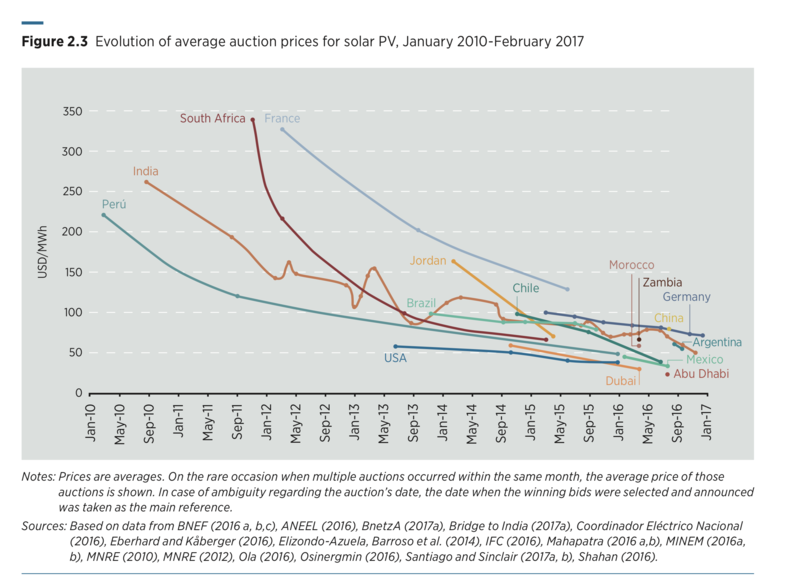 How is it that Mexico, a relatively new player in the energy industry and especially in renewables, has managed to attain through its long-term power auctions the lowest subsidy-free price for green power? The answer may be its free-trade public policy. Not many people - not even Mexicans - know that Mexico has free trade agreements with more than 40 countries with whom we can buy or sell any type of good and services. This means we can look for all the pieces that make a wind or solar farm throughout the world and decide where to buy them. So, for example, a solar farm in Mexico can be made of Chinese solar panels, Mexican steel, Spanish and Mexican engineering, German inverters, DC wiring from Europe, AC wiring from the US, Australian monitoring systems and German commissioning. And when every one of the goods and services previously mentioned are purchased because of their quality and price, the final result is a $18 per Megawatt-hour (Mwh) solar farm in the central and sunny state of Aguascalientes. Free trade has been a complicated topic of conversation for years. Nowadays with more countries tending towards protectionism it will become even more complicated; but what if one of the premises of sustainable development - green power - is actually made affordable to any country in the world precisely through free trade? It is well-known that most countries have tried to shift from fossil fuels via mandates or subsidies, but how fast can the energy transition be achieved through mandates? How costly could it become if the energy transition is based on subsidies only? In 2015, Mexico had a total electrical generation capacity of 45,000 Megawatts (Mw), most of which was based on fossil fuels. Only around 10% of the installed capacity was based on renewable energy, excluding hydropower. But with the introduction of new private sector players into the market and the first long-term power auction in the country’s history, 1,200 Mw of Solar and 480 Mw of wind power were awarded through a power purchase agreement (PPA) at a blended average price of $43/Mwh. After the second auction, prices dropped to a blended average price of $33.84/Mwh. In 2017, following the third auction, the blended average price was $19.87/Mwh - and wind became the cheapest way to generate energy with a price of $17/Mwh. Is free trade the sole ingredient needed to achieve the energy transition? Probably not, but it is one of the key ingredients. If countries keep on penalizing each other via special tariffs on one hand, while on the other providing subsidies for energy transition, the market is not going to move as fast as it should towards green power. Above all, it will cost several millions of dollars either through subsidies or in opportunity costs for taxpayers. Mexico can be seen as an example of how energy reform - now being debated under the country's new administration - and the free market has brought us more than 4,000 Mw of new solar farms and more than 1,000 new wind farms to the Mexican energy mix, creating the jobs of the future that are needed for sustainable development. The world without a doubt knows that the shift to renewable energy must be made as soon as possible, and not only due to price volatility but because there is a chance that climate change cannot be undone if we keep on pushing the limits of pollution. Despite the vast amount of climate reports by NGOs and even governments, today we are seeing an alarming rise in popularity of politicians who discredit climate change and promote protectionism. There are fears that the new Mexican government, elected last year, could go the same way. For the sake of the country and our world-leading renewable energy model, we must hope this is not the case.